One of the most populous species in the Realms' plethora, dragons are a unique species of powerful reptile, split into a variety of breeds and subspecies. They have little in the way of defining, strict characteristics, and abilities range across the board. Dragons are the most powerful race found in the Realms, created in the shapes of their reigning Greater Gods. A variety of offshoot breeds related to dragons exist, including the terravyrn, Yorijian dragon, and Circadian dragons. On Conformity What you see here for the types of dragon is simply examples of what the basic structure of these creatures can be. However, all dragons are different, save for the subspecies listed below. A dragon may have a second set of wings; vestigial or functional. They may have feathers, frills, manes, extra tails - you name it. But each falls under a distinct category, based around their arms, legs and wings. A dragon who does not fall into this category may be named a 'mutant', or unclassified sub-breed, an oddity to not only dragonkind but all others who look upon the great dragons with any amount of knowledge, and may also be mistaken for demons or other such shape-changing creatures. Dragonriders Dragons may take riders at any point in their life. A dragon at hatching is free - it needs no rider to survive, and usually for the first twenty years or so, it gives no thought to even taking a rider. A dragon and rider will forge a bond sometimes out of going through extreme danger together, emotional stress, or merely a compelling urge for one or the other to protect their mental counterpart. When a dragon and rider bonds, their minds are connected and nearly unbreakable. If this bond is severed, it will cause great pain to both sides. When a dragon dies, even if the mental bond is still intact and unblocked, the rider survives. But if the rider dies, the dragon is not constrained to his partner's fate. If the mental link of a dying rider is severed or blocked, the dragon will survive. However, if the link remains intact, the dragon will die. Lunar, Solar and Celestials Once long ago, there existed many dragons with celestial alignments; those who called their power from the sun, moon and stars. Very few are left now, so few that they are thought to be extinct. Lost dragons (Celestial, Lunar and Solar) and Gemdrakes are limited store species; please do not make one unless bought. Thank you! Species info credited to Blazeh/Verridith, Skyeh, Lypten, and Entity. 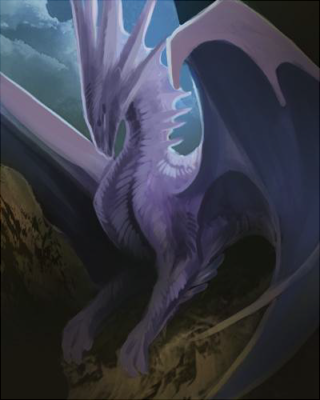 Appearance As this is the most widely known species in BTACD, and the most diverse, this page has sorted the dragon's basic appearance into the various variants, with basic image references. Remember that all actual images in the variants are only examples of limb count and very basic body type, and do not reflect the exact image of the breed itself. Amphitheres are generally dragons without limbs, only wings. They may have a single pair of flight-sustaining wings and sometimes a smaller, shorter pair near where the hind legs would go. Wings can be feather, fur or hide. So named for their originating as dragons living too long underground, the cavewyrm is a serpentine dragon with no limbs whatsoever. It is like a snake, or snakekind, and has no wings or legs. The way they are told apart from serpents or the snakekind kin is that they usually have elaborate horns atop their heads, and can speak in the common tongue without the hissing sibilants of a snake. Eastern dragons differ greatly from westerns in both appearance and physical ability. Many are smaller than westerns, longer and slimmer in build. They have four limbs - sometimes six - and five talons on each paw. Very few have wings. The reason that these dragons are called 'easterns' is because the breed originated in the Demon Realm, after some dragons transferring to Felnova from Millirand got transported there instead, and were changed by the reiatsu of the Realm itself. They populated the eastern region of the Demon Realm for thousands of years before returning to Felnova, where they were hailed as miracle survivors by the Ancients of Millirand. With their newfound wisdom, these dragons spread out through Vystriana and the other Felnovian lands, teaching the young and old alike. A ground-based runnerdrake, often called a groundrake, is a quadruped version of its wingless cousin. Walking on all fours like a cat or dog, some have retained the slender shape of a runner whilst others have become bigger and bulkier, more suited to walking great distances and moving heavy boulders, as many of the mountain-kin do carving caves from solid rock. The hexadragon, or hexadrake, is a western that has developed a third pair of legs. These six-legged dragons are rare in any Realm, and tend to live away from other dragons due to their 'mutation'. The hydra is classified as a dragon - any of the breeds - with more than four heads and very dull scales. They are less intelligent than normal dragons and live in packs or prides, much like wolves. However, despite their lack of intelligence, the mastery they've gained over whatever element they control can be nearly one hundred times that of a simple western. Luckily, the hydra is very rare and the world is in no danger of being destroyed by their magic. Note that dragons with normal intelligence levels and more than three heads are not considered to be a hydra. The lindworm is a long, serpentine dragon with no wings and only one set of legs, either hind legs or arms. Most are quite bad-tempered, and many will join enemies of their brethren to get revenge. The reason for this is that many westerns tend to have low opinions of their smaller cousins, and many have jokes about both their winglessness and size. The wingless dragon, or runnerdrake, is a dragon with four legs and no wings. Usually built like a raptor, these dragons are known for their speed and stealth in catching prey. The sea serpent, or oceanwyrm, is a finned dragon of the sea. They may have wings and four limbs, like the western, but in addition to their western qualities they have gills and webbing between each claw. They also tend to be smaller than most, having to navigate the ocean waters and eat smaller prey than land dragons do. The common oceanwyrm, however, is a short-limbed dragon without wings, with large frills and a fan-like tail. The serpynt is a long, snakelike dragon with lizardlike legs and flightless, vestigial wings. Their scales are much less brightly colored than traditional westerns or easterns, and they tend to live near sources of water. The traditional, or western, dragon has four legs with one set of wings, very rarely two. Most are scaled, but they can have fur, feathers, skin or hide. Can most often fly, unless wings are too vestigial to sustain flight. Adults range in size from a horse to very nearly a mountain (the ancients only), barring special circumstance. The wyvern is a dragon with two hind legs and a pair of wings, though multiple wings have been reported. Usually colored to their element and, like the amphitheres, they may have scales and hide, fur and feathers, or a combination of all. Culture Dragons are creatures of free will. Any individual dragon may be good or evil, or anywhere in-between; all dragons experience a vast array of emotion similar to that of a human, and are one of the most intelligent of sentient species. Thus, dragons can fill any role should the individual fit well in their desired field, and such creatures can be found scattered in multiple Realms in various countries, great and small. In the Realm of Felnova, most dragons are led by the royal family descended from the First Dragon, Kazule. Currently, the country of Vystriana is led by one such royal - the Queen Verridith, and her court. Abilities Of the sentient races, dragons have quite possibly the most diverse and expansive range of magical potential of any species, intelligent or not. Most dragon types may be born with magic, and the range and power of abilities - both elemental and not - vary by individual. Dragons tend to have great affinities for elemental abilities, though a great number have been known to harness various nonelemental magics, and incredible reiatsu use. Due to their versatility, these creatures are considered some of the most powerful in the Realms, created in the image of their gods. Many dragons have the ability to generate breath-weapons of some degree, elemental or non, and either magical, biological, or a mixture of both. The most common occurrence of breath-weapons has been the ability to breathe fire, which has left a mark on multiple legends and tales. However, dragons are not restricted to fire, or having breath-weapons at all - many do not. Some dragon types may be more skilled in certain abilities than others. Easterns generally have more magical potential than other races, and are usually very swift and evasive. Sea serpents often have an elemental affinity for water, and cavewyrms can often sense heat beneath the ground, as well as detect uninhabitable conditions long before other unwary races stumble into them. Runnerdrakes and groundrakes are often faster and have more stamina than their other variants. For many, it depends on the individual, and these differences may be passed in varying degrees. Once, there was nothing; a nothing so deep and vast that little could pierce it. When the One created the first spark of light, and crafted the first few beings to live in the doomed World, it is said that he crafted them from light itself in the form of odd creatures very unlike what exists today. However, when the World fell to the lack of balance and the First Realm was born, the first races were nothing like what we know now. They erupted in war, and the One felt the need to stop it; thus, he crafted the first of the Known Races in his own shape. A species to rise and rule the warring peoples, to stop the bloodshed and end all war. The dragon. The first dragon's heart was crafted of fire and light; the One took wind and bound it into wings, molded stone into strong muscles and capable limbs. The tail and neck was spun from water, claws and horns fashioned of ice. Lightning granted great beauty, and darkness an inescapable power. In this chaotic form, the One carved protective scales, and planted in them all the colors of the world. The Void hydress, smiling at the One's creation, gave the first drake her own gift - and a true name. Kazule, King of Dragons, felt life curl within him as a single head and tail split into five, and power radiated from him stronger than the force of all the elements combined. The earth trembled beneath his claws; fire greater than a thousand infernos burned within him. The wind howled at his command as a tornado, and rain crashed down around him when he willed. Lightning sparked with great booms of thunder when he spoke, and ice frosted everything he touched. You will be the one to lead all that follow, the One rumbled, as the new-made dragon looked around in wonder at the beautiful world that it had been born into. You are Royal, a King. You hold the blood of those much more powerful than others; your race will be supreme, shaped in My image, and you will rule as I have intended. Go forth and let the blessings of the One and the Void go with you, King Kazule, First of Dragons. As Kazule learned how to control his powers and explored his new Realm, the One crafted other, lesser dragons to follow him; those with four legs and a pair of wings, a single head and jewel-bright scales. Over time, through the First Realm and into the Living Realms we know today, many other dragons were to follow. All are still ruled by the royal bloodline of Kazule, the first of dragons, though none from the First Era live now today. Name: Kazule. Location: N/A. Status: Dead. The First Dragon was the first of all royals, an Ether of the Light Realm, and King of Millirand for many years. Kazule Silentscale was his name, known for an uncanny ability to fly and move with absolute silence, even considering his usually-gargantuan size. He was the most powerful of dragons, and had the ability to split his consciousness and body into five separate drakes, much like the One and Death. In his normal form, Kazule was a massive five-headed dragon with iridescent, rainbow-hued scales that shifted and changed color with movement. His central head sported golden scales and six facial horns, topped with large, curved horns that were metallic silver in color; his eyes were a deep, dark violet. The head to his right held blue scales and purple frills, with scarlet eyes. The head to his far right was onyx in scale color, with dark gray, ram-shaped horns and silvery eyes. To his immediate left, a head with scarlet scales and sky blue eyes rose, with long black spines. To the far left, a head with scales white as snow, silver fur and blazing golden eyes. He had large wings with white webbing that shaded to silver, and long tail-frills that helped support him in flight. Each neck's various spines, horns and plates turned to black feathers sent trailing behind him as he moved, and his tail held a silver spade at its end. Each form he could split into corresponded to one of the heads, each named differently as a play off of his true name, Kazule. From right to left, there was Lazul, Bazul, Kazul, Tazul, and Fazul. Lazul was a slender black dragon with sharp, angular features, and control over darkness and lightning. Bazul was a large blue dragon with multiple frills and wide wings; he had control over water and ice. Kazul was a graceful gold dragon with silver horns, and had control over fire and light. Tazul was a bulky red dragon with control over earth and heat. Fazul was a delicate white dragon with powers over ice and wind. Long did Kazule rule over Jes're'en and all of Millirand, after coming from the First Realm; he won many wars, and set in motion events that still echo thousands upon thousands of years later. 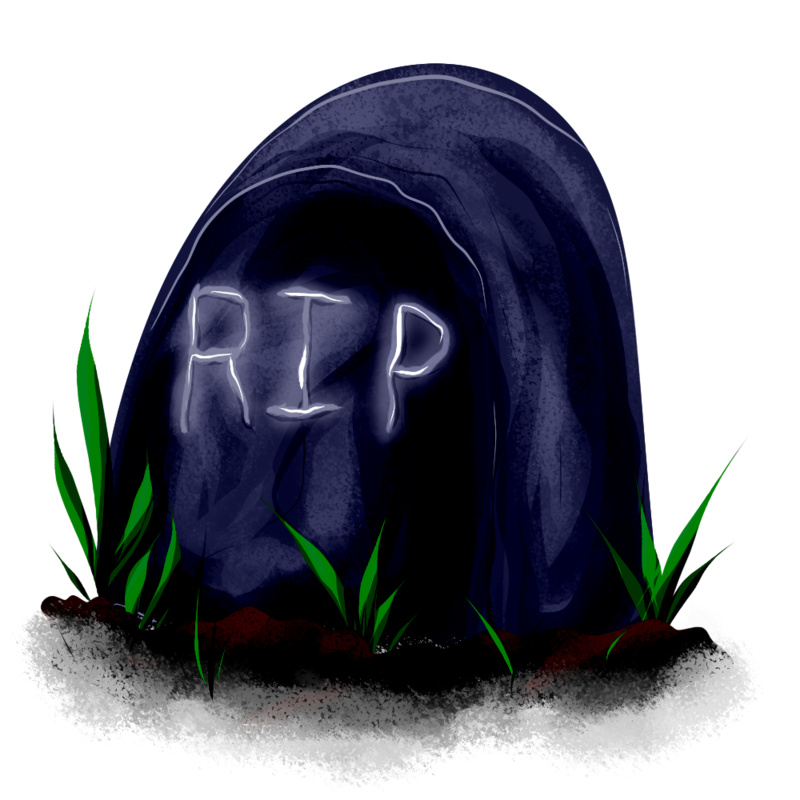 He met his end at the fangs of Snayc, in an ambush that took the First Royal's life. Classification: western or wyvern. Location: widespread. The Albino, or Blackbone, dragon is a unique dragon subspecies with varying shades of white scales, sometimes white fur, and hard black bones. Some have manes or frills, the hair and web always white, rarely translucent and clear. Their horns and claws and black, as are their bones, and they have a connection to the Sight and many may see visions of the future. Classification: very rare dragons infused with the light abilities of the cosmos. Location: abroad. A dragon of the heavens, with a connection to the sun, moon, and stars. Great dragons of generally light coloration, strong creatures created by the gods from the energy leftover from the creation of the royals, and infused with the energy of the Light Realm. Very nearly extinct, very powerful dragons who's abilities focus on the sea of stars and the celestial bodies within the Realm that they are currently in. Celestial dragons are usually gifted in the Sight and the element of light and healing, though other abilities are always possible. 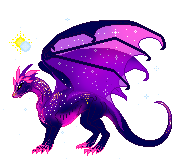 Classification: very rare dragons infused with the dark abilities of the cosmos. Location: abroad. A dragon of the heavens, with a connection to the sun, moon, and stars. 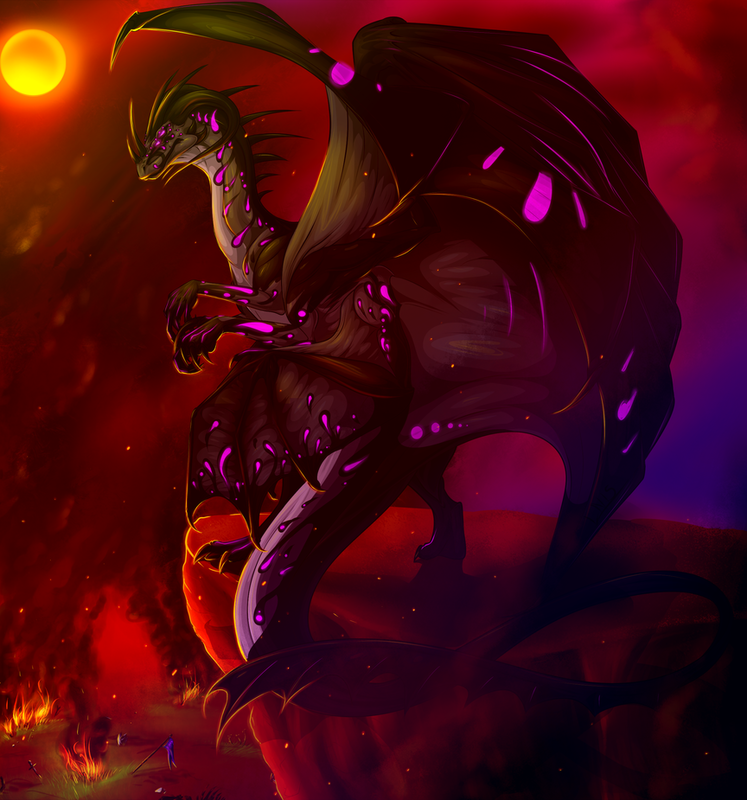 Great dragons of generally dark coloration, strong creatures created by the gods from the energy leftover from the creation of the royals, and infused with the energy of the Dark Realm. 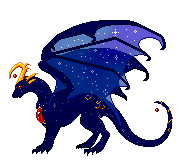 Very nearly extinct, very powerful dragons who's abilities focus on the sea of stars and the celestial bodies within the Realm that they are currently in. Cosmic dragons are usually gifted in the Sight and the element of darkness, though other abilities are always possible. Classification: western. Location: Exodus Desert, Vystriana. 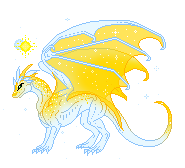 The Desert Gold is a dragon of the desert with varying shades of gold scales, and a thick white mane usually running from their brows down to their tail. 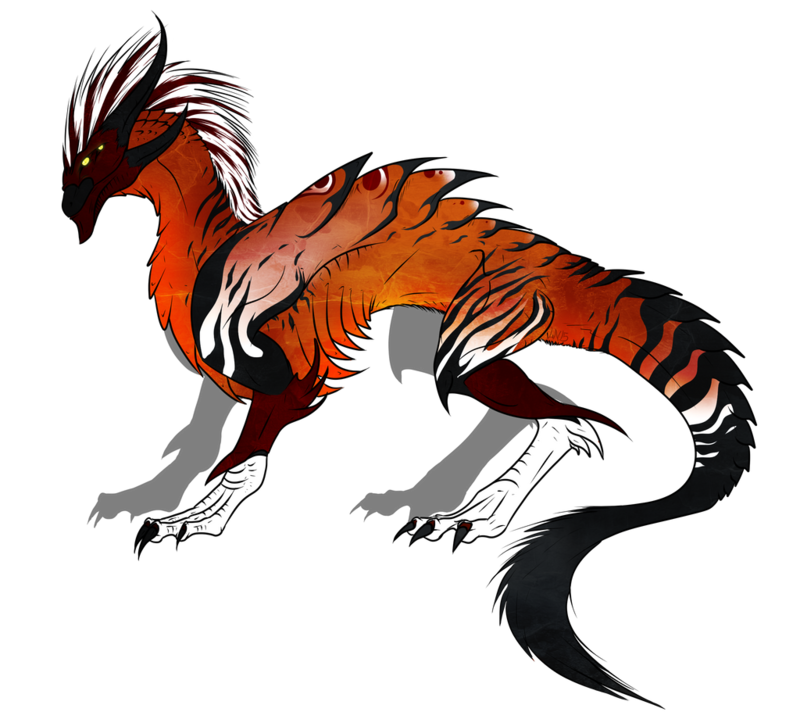 Many, if not all, have white markings - usually bands or stripes - that vary with each individual dragon. Many have bi-colored eyes, and darker gold, sometimes orange, points around the feet and wings. The Desert Gold is also known for its efficiency with fire magic, and the creation of strong barriers. Classification: any dragon type. Location: widespread. Small, generally western-based dragons who's scales begin to hyper-mineralize as they grow older. Gems will begin to form inside of their scales, making them look veined in crystal, before the scales are overtaken completely. Usually, mineralization begins on the chest, back and head. Then it grows to encompass the legs and tail, before touching every scale on the dragon's body. Very old gemdrakes will look made entirely of living crystal. Gemdrakes shed their gem-scales once a year in the springtime, in which new scales will grow in their place. Mineralization in these new scales is very, very quick, and the gems may return within a week of the initial shedding. These shed scales are gemstones, usually of a variety of color, and can be used in a multitude of magical workings, or jewelry. These dragons generally hatch with pale, almost pure white scales, which begin to take on the colors of whatever minerals they consume. Gemdrakes who abstain from consuming minerals may develop pearl-colored gem-scales. While they most commonly look like western dragons, variations can and do occur - any subtype is possible, from the wyvern to the groundrake, though these are much rarer. The gurtha dragon, also known as the gurthadrake, is a dragon who has risen from the grave in skeletal form in a variety of ways. They appear wreathed in reiatsu, often burning fiercely in the color of their spirit in their chest cavity and other places sheltered by their strong bones. Their aura can be as large as their former bodies were, or be a gentle glow barely seen, depending on the gurtha's strength of spirit. Body-type spans every variant and subspecies of dragon, though most gurthadrakes do not retain many, if any at all, of their former abilities. They are vulnerable to spiritual attacks and physical attacks that may crush or break their bones, and if their reiatsu is spent entirely or eradicated, they will be completely destroyed and their souls will not return to the Spirit Realm. A gurtha's soul may only return to the Soulplane if they accept their death and release their hold on their skeletal body, accepted back into Linath's grace. Classification: western. Location: Heartwood Forest, Evylon. The Heartwoodian Gold, or Evylon Gold, is a western dragon with gold scales. They are large and slender, with eye color ranging from yellow to green to a deep blue. Frills flank their faces and fan their tails; their wings have some of the largest wingspan of all the Heartwoodian dragons, most of which are horse-sized or little larger. The web can range from the gold of their scales to a dazzling white, as can their horns and claws. They are one of the few dragons that have befriended the elves, and will often visit with those of weaker races, fighting the Blacks and Greens who wish to devour them. These Golds are dragons of light and fire. Classification: western. Location: Umbar Mountains, Evylon. The Heartwoodian Black, or Evylon Black, is a western dragon with scales or hide that may be any shade of black, darker or lighter markings of deep greys (never silver) often present. They have sharp features and often many spikes, as well as tails tipped with poisonous blades. Their faces are sharply defined and they have no fewer than four crooked horns, smaller spikes lining their chin, as well as their wrists and heels. Their fangs are covered in scaled hide and seem to be a part of their mouth, holding a deadly poison that paralyzes upon penetration. Their mouths and inner flesh, from eating creatures changed by Evylon's reiatsu, glows softly red, the same color as the acid they spew at opponents who face them. Classification: wyvern and (rarely) western. Location: near Shimmering Elera and Heartwood Forest, Evylon. The Heartwoodian Silver, or Evylon Silver, is a beautiful silver dragon with either western or wyvern qualities. They are about the size of Heartwoodian Golds, with white accents and mirror-like scales. These dragons have plated armor on their brows, shoulders and thighs, as well as down their necks and backs. They have slanted eyes that range across a variety of blues and greys, and have frills that frame their beaked muzzles. Ridged spikes run from the middle of their forehead down to their tail, ending in a spade. These dragons hold power over lightning and electrical currents. Classification: wyvern. Location: Heartwood Forest, near Abel, Evylon. 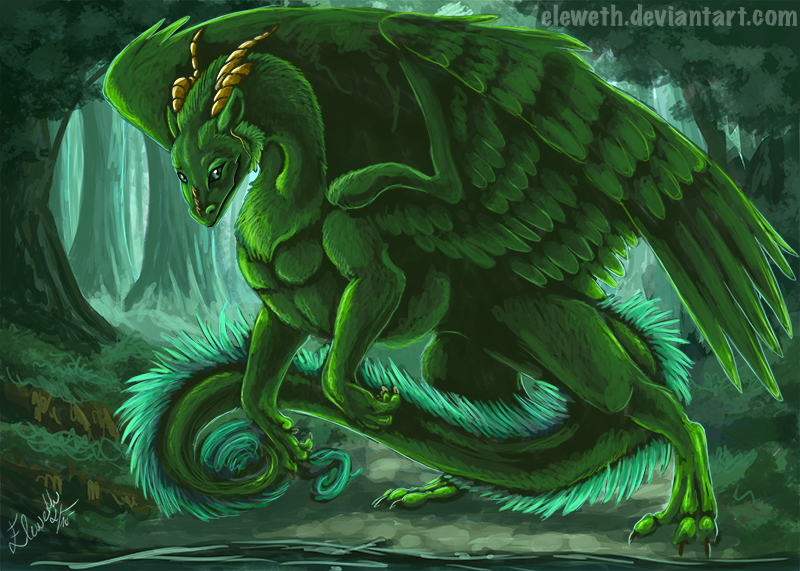 The Heartwoodian Green, or Evylon Green, is an almost-awkwardly built wyvern with emerald scales, large frills and lighter, jagged markings. A small breed of wyvern with a birdlike face and long, slender wings, the Green has the temperament of a discontented badger. It will attack needlessly and for sport, and gets irritated at the smallest things. Luckily, this strain of Heartwoodian dragon is rare, and its poisonous breath is easily avoided. Classification: wyvern. Location: Northern Evylon. The Heartwoodian White, also called the Evylon White or Evylon Frostdrake, is a snowy white wyvern found in the northernmost mountains of Evylon. The White is a long, slender wyvern with two sets of wings - one main set, white-webbed and touched with either creamy or rosy hues; and a smaller pair set just beneath where the main wing arms are. This dragon's face is very narrowly built, frills extending from its chin to connect to the length of its main horns, web stretched taught and thin. These dragons love to terrorize elves and, more often, frighten animals from their homes, freezing them in their tracks as soon as they flee from their holes. They delight in using their frosty breath whenever possible, and have been known to coat entire forests in ice. Classification: western. Location: Western Heartwood, Evylon. The Heartwoodian Red, also known as the Evylon Red or Magmadragon, is a red-scaled monstrosity known to live in the volcanoes in Evylon's far western reaches. They are very rare and only leave their volcanic homes when hunting or provoked. Great creatures that are varying shades of red and orange, covered in sharp scales and many spikes; black scales in round or rocklike patterns adorn their backs, necks, shoulders, and tails in various ways, much like volcanic stones. They are masters of fire and lava, and relish the heat in which they live. Classification: sea serpent. Location: far South of Heartwood, rarely seen in the seas below Deathstar, Evylon. The Heartwoodian Indigo, or Evylon Indigo (also sometimes referred to as the Elven Sea Serpent) is a serpentine sea serpent colored in shades of deep blues, teals and greens, with varying markings of all three colors. They are a rare breed and are seen in the oceans south of Heartwood, beyond Glory and Deathstar. 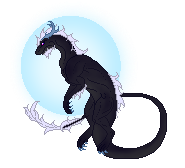 Classification: rare dragons aligned with the power of the moon. Location: abroad. A dragon of the heavens, with a connection to the moon. 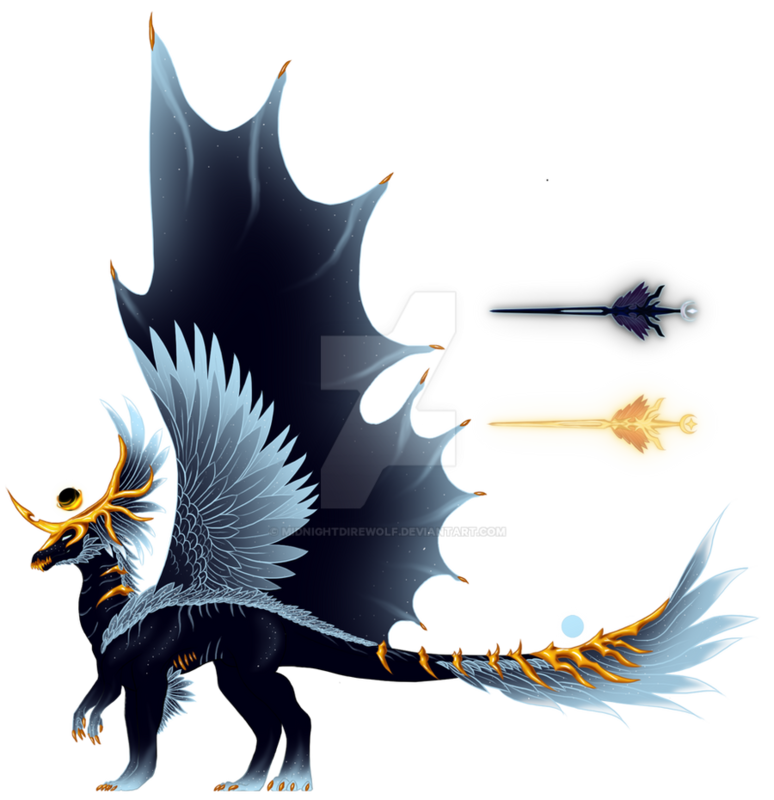 Once were very common, a subvariant of Cosmic and Celestial dragons, almost altogether destroyed by the Celestial Wars. Though Lunar dragons are much more common than both Celestials and Cosmics now, they are not nearly as powerful, and draw their magical strength from the moon's silver light. In the daylight, their power wanes, and at night, it is strongest. 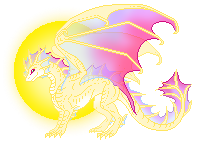 Classification: rare dragons aligned with the power of the sun. Location: abroad. A dragon of the heavens, with a connection to the sun. Once were very common, a subvariant of Cosmic and Celestial dragons, almost altogether destroyed by the Celestial Wars. Though Solar dragons are much more common than both Celestials and Cosmics now, they are not nearly as powerful, and draw their magical strength from the sun's rays. At night, their power wanes, and in the full sunlight, it is strongest. Classification: Very rare dragons infused with energy of the Void. Location: Stroen'na. During the great magestorm that create Stroen'na, several dragon eggs were sealed away to protect them from the storm's terrible energy, and were subsequently carried into the Void for many decades, safely in hibernation. However, they were altered by the mysterious energies of the Void, and developed a strong connection to it. Crystal orbs formed within their chests, visible for all to see. These crystals carry within them the memories of not only the dragons themselves, but their ancestors as well, granting them great insight into the past and the experience of ages, despite their relative youth as a species. Their hides are typically dark, although the exact shade varies, and their eyes are the same color as the crystals within their chests.